Brown recluse spiders, also called violin spiders or fiddleback spiders, contain venom that can cause serious injury and death. These spiders are found mainly in the central Midwestern states southward to the Gulf of Mexico. Though Southeastern and Midwestern states are the primary regions for the spiders, they can be transported inside boxes and packages to other states. The brown recluse is non-aggressive, but it will bite when accidentally disturbed. Brown recluse bites are necrotizing, which means that they cause skin tissue to die. No antivenom for brown recluse spider bites is available in the U.S. as of 2015, and medical treatment is often required to slow or halt serious physical complications. 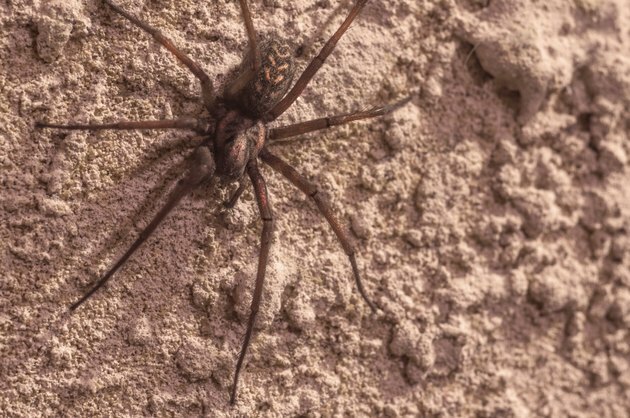 According to the CDC, people who frequently work outdoors as the brown recluse can be found in "secluded, dry, sheltered areas such as underneath structures logs, or in piles of rocks or leaves." The most identifiable characteristics of this type of spider are that it has six evenly-sized eyes (while most spiders have eight) and a violin-shaped mark on its head. After a human is bitten, the wound site may become infected and the victim's condition changes in various stages. Various stages may occur within the initial 24 hours after a bite occurs. The first is stinging and redness followed by pain radiating from the bite wound and then a blister and ulcer. As the venom begins to spread, the wound site may become reddish or purplish and swollen, and some patients notice that the area becomes puffy or hardened. This redness may occur simultaneously with the sensation of stinging. Pain, which can range from mild to severe, develops within 2 to 8 hours, according to the textbook "First Aid, CPR, and AED". The pain can become increasingly more intense as time passes, radiating from the bite spot. It's not until about 24 hours after the bite occurs that a blister will form at the wound site, which might appear white. When a bite turns white, or blanches, the area around the bite develops a red ring. The bite site itself may appear sunken and bluish. Some patients develop a spreading, pinpoint red rash. Within 48 to 72 hours, a blister forms at the puncture site, turns red and bursts. The wound is left as an enlarged ulcer, which can be reluctant to heal, and infection may develop in the wound if it's not treated properly. Subsequently, the blister hardens and sloughs off. According to the CDC, necrosis -- death of the tissue -- is caused by the brown recluse spider's venom, and necrosis can make the skin ulcerate, slough off or turn black after 3 to 4 days. Necrotic wounds can require skin grafting in the future if they are large or severe enough. As per the NIH's MedlinePlus, other symptoms of a bite might include fever, chills, itching, general ill-feeling or discomfort, nausea, weakness, muscle pain, abdominal cramping, vomiting, diarrhea, sweating, and, in rare cases, a coma, blood in the urine, jaundice, kidney failure and seizures. Although most brown recluse bites do not cause significant injury, a brown recluse spider bite can occasionally cause a systemic reaction, called loxoscelism. This complication develops within 48 hours of the bite, according to the textbook "Conn's Current Therapy" and can lead to destruction of red blood cells, known medically as hemolysis, or to kidney damage or jaundice, a yellowish tinge to the skin associated with destruction of red blood cells. Hematocrit -- a ratio of the number of red blood cells in whole blood -- can drop significantly as the venom destroys red blood cells. If you see you a spider bite you, save the spider if possible for later identification. According to the University of California, Davis, many more common types of spider or insect bites are misdiagnosed as brown recluse bites, so if there are multiple lesions on one person at the same time, especially if the lesions are on widely separated parts of the body, or multiple episodes of lesions or multiple people in the same house or facility showing skin lesions at the same time, it's likely not a brown recluse spider bite. Staph infections like MRSA (methicillin-resistant staphylococcus aureus) are also commonly misdiagnosed as bites because of the telltale necrotic flesh caused by the venom. First aid is the first line of treatment to help slow the damage from a brown recluse spider bite. Victims should wash the bite and skin around it with soap and warm water. Elevating the bitten body part, if it is an arm or a leg, and tying a bandage snugly above the bite can slow down the venom in the bloodstream. An ice pack applied to the bite can help alleviate swelling, leaving it on for 10 minutes and then off for 10 minutes. Call a poison control center or your physician for more information about treatment. If systemic reactions occur, seek immediate medical treatment. Children, who often visit areas inhabited by the brown recluse, are at particular risk of a dying from a bite. However, according to the University of California, Davis, "About 10% of brown recluse bites cause moderate or greater tissue damage and scarring, but the vast majority heal very nicely without medical intervention." As mentioned, there is currently no antivenom available for brown recluse bites. Since the venom can cause a systemic response in the body, resulting in swelling, fluid buildup and an allergic reaction, steroids, antihistamines and anti-inflammatory medications may be useful for reducing the effect of brown recluse venom, as per a a 2004 article in the "Journal of the American Board of Family Medicine". Steroid cream or injections applied to the bite may decrease swelling and reduce pain. Antihistamines aid in reversing the body's allergic response to brown recluse venom. Antibiotics may also be used to prevent secondary infection from the spider bite and stimulate healing of any skin tissue that was damaged. Because ulceration can spread and tissue death can occur, skin that becomes necrotized in response to brown recluse venom may need to be removed through surgery. Cutting away dead skin tissue can help promote wound healing and the formation of new, healthy skin, over the wound. Additional surgery may be required after skin has healed to improve the appearance of any craters or scars left behind. According to NIH's MedlinePlus, "An ulcer may take up to 6 weeks to heal, with proper care." What Should You Do for an Ant Bite on a Toddler?